While 35% of respondents are based in mainland China, Hong Kong and Macao, the survey attracted contributions from all over Asia, Europe, Africa and North and South America. However counsellors’ reach extends across almost every continent – and serve all major destination countries. 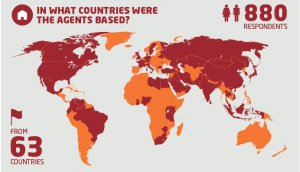 Which destination markets do agents represent? If this sample is representative of the education agency sector as a whole, there is barely a destination market around the world not served by independent education counselling organizations. Across those surveyed, the destination locations are dominated, for the moment, by traditional education superpowers, with the United Kingdom, the United States, Canada and Australia cited as the most popular destinations. Malaysia and Singapore – both education hubs in their own right and major transnational education locations feature prominently amonsgst those destinations recommended by counsellors around the world. Much has been made of China’s emergence as the world’s third largest destination country, for international students after the United States and the United Kingdom, as reported in a recent ICEF Monitor feature. The trend is being picked up on or perhaps to some extent driven by the agent base. The survey reveals that China is ranked above both France and Germany as a destination which agents counsel towards. The increasing quality of Chinese universities, the increase in the number of degrees taught in English and the growth of branch campuses of western universities in China all indicate that agents are recognising and responding to increasing student demand. Despite the continued dominance of the traditional education superpowers and the rise of China, it is clear from the word cloud below that agents represent all countries which promote themselves as a destination and to which students express and interest in studying. Outside of the traditional powers, it is Ireland, Malta, Spain and Switzerland which were referred to most often by agents. Education counselling organisations are growing in maturity. Approximately 83 per cent of those surveyed have been in operation for six years or longer with 62 per cent in operation for eleven years or longer . Unsurprisingly, parents are quoted as being the key influences in student destination decision-making process. But when it comes to graduate level study, the influence of parents diminishes substantially. However, the survey did identify an increase on the impact of parents compared to previous years[ . At the pre-undergraduate and undergraduate levels, 20 per cent of respondents believe they are the most influential decision makers. As the chart below illustrates, less than 14 per cent of respondents believe that all or most of the students who come to them for counselling have already chosen an institution. On the other hand, 66 per cent of counsellors state that all or most students have chosen the destination country. While there is a clear role for destination marketing within agencies, it appears even more vital that institutions can frame their offer within the context of the country to which the student aspires. Outcomes, outcomes, outcomes. Why do your students choose to study overseas? Unsurprisingly the majority of agents point out their students believe that overseas study will enhance their longer term career prospects. Importantly, this is not a migration issue, which is actually a relatively small motivating factor. Universities are already aware of the importance of education which enhances employability to their domestic students. Clearly this suggests it is of equivalent importance to their international students. A focus on delivering a student experience which also ensures students have opportunities to develop personally is clearly picked up upon by those counselling students on their study options. Innovative study methods, integration with home students and vibrant extra-curricular programs are all likely to be attractive to students seeking personal development. What matters to agents when counselling students and in their relationship with institutions? Unsurprisingly university rankings and location are most often highlighted when counsellors are advising students. Yet, it is response times and student feedback on their experience which count for more in terms of building a relationship with an institution. More than 99 per cent of respondents highlighted service quality and response times as important or very important. For 83 per cent of respondents timely response times to enquiries as the most important factor in a relationship. And 77 per cent indicated that response times to applications as very important. There are lessons here for most institutions when working with counselling organisations. While glossy literature, generous scholarships and compelling websites are important, it is much more important to focus on the basics. An institution investing in promoting its programmes through agents needs to invest in ensuring there is an infrastructure in place to provide credential evaluation services and mechanisms to ensure swift turnaround times. For the first time, we asked counsellors about their experience of and attitudes towards online education. While the majority of agents (74 per cent) do not currently promote online programmes, 90 per cent would consider promoting online programs in future. It is clear that most of higher education in the developed world has identified the development of online education as a game-changing mechanism to extend reach and impact. It cannot be long before they need to look again at the role experienced agents can play in helping students to navigate their way through a widening range of options. The Last Word: How do students rate the services of the agents they use? Based on our September 2013 cohort, seven out of ten students apply to INTO and our partners via an education counsellor. While this figure is dipping slightly, this reflects the growth of other channels rather than a diminution in the importance of agents who remain vital. Student outcomes and feedback on the quality of service, advice and guidance they receive from agents remains high. Each intake, INTO surveys all of its students to gain an insight into their pre-arrival experience. Data from almost 2000 students who began their courses in August and September 2013 gives agents a major vote of confidence – with 94 per cent of students ranking the service they received as good or excellent. For the China sub-set of respondents, this figure stood at 94 per cent of respondents ranking the service they received as good or excellent. This was an increase on the previous year and perhaps more importantly those considering the service received as ‘very good’ rose from 35 per cent to 40 per cent. This may reflect the growing maturity of the sector and agents increasing focus on delivering exceptional customer service as a differentiating factor in a competitive market.